On Sunday, 17 August at about three o’clock the population of Edington will increase by ten per cent as seventy people arrive to become the Music Festival. They will come together from all over the country, singers from cathedral and collegiate choirs as well as those who are happy to take on less glamorous tasks to keep the Festival running. By nine o’clock the Festival will be ready to begin its worship with the first Sequence of Readings and Music, and then will follow a daily cycle of services beginning with Matins at eight in the morning and ending with Compline at nine-thirty in the evening, concluding a week later with the final Solemn Eucharist. This year there are more sung services than ever before – a total of thirty – and for the first time there are trebles in both choirs. As in past years the office services of Matins and Compline are chanted by all present, whilst the music of the daily Eucharist and Evensong, and the additional Sequences of Readings and Music is shared between the two choirs. These two choirs sing music of differing styles: while the Chancel Choir performs music written in Italy during the late Renaissance, and plainsong based on the Vatican edition, the repertory of the Nave Choir is mostly of English and French Music of the nineteenth and twentieth centuries, though it also includes anthems by Bach, Bruckner and Byrd, Tallis’s Lamentations and Monteverdi’s Mass published in 1651. So music written over a span of 1,000 years for the worshipping church will be sung in the rural splendour of Edington’s Priory Church. 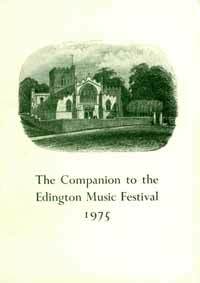 This is the twentieth Music Festival to take place at Edington and its intentions are the same now as when it started in 1956. For those taking part it is a holiday of hard work and worship, demanding a financial contribution rather than a financial reward. And those who join the Festival as visitors will find none of the lush facilities of urban festivals. Edington has two inns, three shops, a parish hall, and a hut near the church which provides refreshments: you would expect no more in a small village. There was a time when I apologised for these limited facilities, but no longer, for they are essential features of Edington and its Festival. You will not be badgered to pay for this and that, for the Companion is all there is on sale; you will not have to book tickets in advance, for there are none: instead you can walk up from the Priory Field and into the Church, take a seat where you can find one, and worship God through music. And if you value what the Festival stands for and wish to see it flourish, then I would beg you to be generous when the collection plate comes round: we need a thousand pounds in that plate to pay for the Festival. The large number of options available not only in the different orders of service but also within those orders makes a word of explanation necessary. The orders of Matins and Evensong conform to the 1662 Prayer Book beginning, however, with the Preces and Responses and adding an Office Hymn before the Magnificat at Evensong. Except on Monday and Wednesday at Evensong when the psalms appointed for the evening are sung, the psalms and readings for these services follow the Alternative Lectionary. The order of Compline is the same each evening and can be found in the duplicated booklet. The order of the Solemn Eucharist is that of Series 3. The exact order will vary slightly from day to day in accordance with the flexibility of the rite. The readings will be chosen to suit the intention of each Eucharist which will be posted on the church notice board. The Sequences of Readings and Music are free forms of worship designed specifically to exploit the resources of the Festival. Each explores a particular theme. The opening Sequence is a form of dedication for the Festival and includes anthems to the Blessed Virgin Mary to whom, with St Katharine and All Saints, the church itself is dedicated. On Tuesday evening the Old Testament readings about Jerusalem and its temple raise issues still current in the church today. The evening services on Thursday, Friday and Saturday are inter-related and echo the pattern of Holy Week. Beginning with the Solemn Eucharist in thanksgiving for the institution of Holy Communion on Thursday, Friday’s Sequence focuses on some of the less dramatic moments of the Crucifixion. On Saturday, from the Gospel sung in the distant Chancel the news of the Resurrection spreads to the screen with an extract from a medieval church drama and then, with a great procession through the Nave, the Sequence culminates in a hymn of Easter thanksgiving with the visionary poetry of Gerard Manley Hopkins and Christopher Smart and the music of Byrd and Britten.